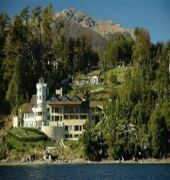 El Faro Patagonia is an outstanding Hotel, an exclusive House and a SPA with natural spring and thaw water built by the Nahuel Huapi Lake in Patagonia. 16 Rooms and a House overlooking the Nahuel... Show moreHuapi Lake and the Andes.El Faro House is a synthesis of intimacy, independence and privacy. The hotel has an excellent view to the wellknown Nahuel Huapi Lake. All bedrooms have large windows, wide decks and a private patio, you will be able to admire the beauty of the landscape with family or friends.